This month marks my one-year anniversary of returning to my beloved Galactic Civilizations as its lead designer. And since then, we've made a lot of changes much to the joy and angst of many galactic conquerors. With the announcement of the third expansion pack to Galactic Civilizations III imminent, this serves as a good time to look at where we stand today. For the past year, I've been going through and weeding out improvements, events and other game modifiers that had unintended consequences. The very first thing I did was read all the forum posts on GalCiv3.com, Steam, Reddit, elsewhere and see a lot of criticism for what amounts to unintended consequences of multiplying bonuses. Getting rid of these has been good for the game but not all players appreciate the changes since it dramatically nerfs their gameplay. For example, with the right combination, you could get ships with a base speed of over 40 moves per turn. That's without adding an engine. There are players who have posted complaints at how slow things get when they try to move their 90 move per turn ship around late game on a ludicrous sized galaxy. The game itself was designed (and thus the underlying engine) on the premise that you wouldn't get many ships with more than say 10 moves per turn. While the AI could be scripted to do the same thing, it would destroy the game. If you think it's slow for you to move a ship 90 moves per turn, imagine 60 AI players doing it with 400 ships per turn. Even with a multicore Astar path finding algorithm, it would make the game both unplayable and not fun (what's the point of even having defenses or a forward line if ships can swoop in from sectors away every turn?). So there's been a lot of work to get things balanced together. It's not a matter of trying to change the game around as much as making the game play as had been originally intended. As a math nerd, when I came in and saw the numbers it was just a matter of time to find all these unintended bonuses and kill them off. One of our Fall tasks was to do more focus testing on why people don't find GalCiv III that approachable. From watching new players, one thing was incredibly obvious. The DESIGNER button at the top of the screen of the main screen was killing us. Think about it. You're new to the game and you are just clicking on buttons and you click on the Designer button and you get a super complex screen. It's poison to new players. The thing is, we don't really need that button. For one thing, players can design ships from the main menu now. Secondly, the ship designer, while super cool, isn't one of the features you need to use to manage your empire. It belongs as part of the shipyard. The second big task we worked on for 2.8 was the AI managing legions. The concept of having to train legions and then put them on transports was relatively new as of 2.5. And while the GalCiv III AI is somewhat genetic in how it works, I still have to make the "tests" that it has to pass to determine whether it's on the right track. Unfortunately, I was quickly schooled by other GalCiv players in not being very good at keeping a healthy supply of legions and transports ready to deal with opportunities. And my own weaker assumptions got passed on to the AI. Version 2.8 addresses this. Hard. The rest of the AI changes were small but add up to a big difference. For instance, previously, the AI had a one-size fits all fleet size. While good enough for most players, our better players found themselves able to actually out compete the AI even on harder levels. Thus, the AI gained the ability to evaluate different sized fleets based on a number of galactic conditions (instead of a fixed size). Most of my work was on Crusade. We brought over features from Crusade to the base game but we didn't bring what is arguably the more important aspect of it - cleaning and streamlining. Put your new player hat on and load up the base game. You have tons of technologies to choose from with lots of improvements, weapons and modules that really just are hard to grasp onto. Thus, we streamlined the base game for 2.8 so that there are fewer techs available at the start and what they provide is more obvious and more beneficial. Population growth is tricky. On the one hand, you want it to be realistic but on the other, you don't really want it to be realistic because realism can be pretty boring. So we have population growth default to 0.1 population growth per turn. Many good players recognized that if you loaded up transports with tiny populations to colonize you could get huge benefits by fast expanding. And a big part of our work has been to support tall empires and not give fast expansion too big of a benefit. For 2.8, we made the minimum population you can have on a colony ship be 1. This makes colonizing a planet somewhat more serious than previous and allows us to avoid having to do a % population growth (do the math, there's no happy ending with a flat % growth -- boring or broken). We are in the process of adding some new diplomatic modifiers. One of which is "We have a long, happy friendship" which essentially helps reward players who have been keeping the peace a long time from suddenly having players going to conquer them. We already have various hidden mitigating factors for this but we haven't had anything a player could visibly see. Anything you can do to spread the word on Galactic Civilizations helps. Sales determine how many engineers we can put on the game. When GalCiv III first came out, it was at a supreme disadvantage because it was on a brand-new engine. But now, as we enter 2018, it's multi-core, 64 bit engine is looking pretty awesome as the rapid progress should, I hope, make apparent. 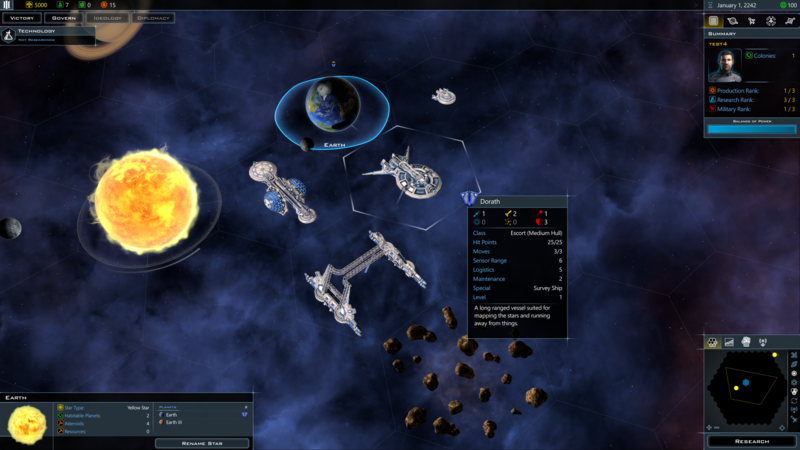 You'll be happy to know that the Spectre and Meltdown fixes you may have heard of will affect GalCiv III very little because we don't rely on single CPU core performance. Those of you who have moved to 4K probably have noticed just how future-proof GalCiv III is. As time goes on, the game gets richer, deeper and more polished and with your help, we can ensure it is the ultimate 4X space strategy game. Ctrl-F5 to refresh if the new editor isn't coming up. As one who happily abused the speed improvements, i'm also glad you nerfed them. You might want to take a look at Cybernetic's Mechanics also. Can't get quite as fast with them but it can still get silly. Please, don't forget about Spanish translation as you promise years ago! I'd like to point out that this is truly one of the best, immersive 4x space games produce with no equal on such an amazing artificial intelligence to play against! Its a real challenge and a complete time sink you will have a hard time trying to walk away from! While I'm a huge fan of GalCivIII, I've been reluctant to play it recently, and the main reason, I feel is because of something mentioned above about accessibility. I've been spoiled rotten by Stellaris, and the way there's a number of ways to achieve almost any action, and it's usually just 2 clicks away. After playing hours in Stellaris the interface for GalCivIII feels cumbersome and disorganised. Paradox of course has the advantage that their engine is almost seven years old now, and they've had lots of time to improve it. Accessibility, and the ease of use of the UI, visual feedback etc, are the main hurdles I face whenever I return to GalCivIII. Which is a shame, because when I get past them and relearn where everything is, I can totally lose myself in the game again. So the new update sounds good and I look forward to it, and of course the upcoming expansion. Why is it interesting to me? Because it relates to yours (and others) recent commentary regarding UI and "ease of intro" for the new player. Here is my short list of what is really hurting GC in terms of being a approachable game. Features that do not truly function (as intended, or simply not relevant/too esoteric)... are seemingly not worthwhile, or otherwise confusing. Specifically, Ship Roles, Ship Threat, Ship Value, Ship Tactical Speed, Tourism, Trade Routes/Licenses, Alliances and Treaties. UI hiding information. Diplomacy being one of the greatest culprits with a highly imprecise visual on relationships +++ or --- tells me very little. Some factors are listed but apparently some are hidden from the player. UI Being very "page happy" meaning, that we get new pages through portals (buttons) to do things, instead of more information on one page (with a scroll button as needed). For example, the planet screen allows me to build buildings, and has plenty of room to fit in the various governor management options, but instead they are relegated to another screen. Another example, is needing to enter the shipyard screen in order to edit sponsors... when it would be more useful to edit sponsors from the galaxy screen where I might actually be seeing the planets I'm assigning (and assigned planets could glow on the screen/minimap to give a sense of distance/etc. These are the biggest challenges to accessibility in my opinion. I'd really consider less overall management screens, it may be overwhelming to have more features per-screen, but at least they are not hidden from the player. I'd like to do more 'management type functions directly from the galaxy screen as well. I am not sure if this is possible but again the shipyard planet assignments should be as simple as licking on a planet and draggin it to the shipyard and getting pop say 'do you want this plant to sponsor 'Vulcan Prim Shipyard'? Y/N. I bought Stellaris and GalCiv3 at the same time. I played through the tutorial of Stellaris and it basically told me to do things to show the interface but the game was not playable (it ran me out of resources) and only by watching YouTube videos was I able to figure out what some of the tutorial was trying to do. But I don't find it accessable or easy to play and quite frankly I'm not even sure what that game's purpose is. It seems to be more of a space civ simulator than anything else. I have not made it very far past the tutorial in GalCiv3 but it seems to be more of an engaging game at this point. 90 moves??? Late Game Ludicrous Map my main battle fleet has over 800 movement, no mods. Yes, it is an unintended consequence. Multiple movement enhancement module ships with five or more commanders in the same fleet. It does make mop up easier. Perhaps you should limit one of each commander type to a fleet. Right now you can separate a single ship from the fleet, add a new commander, and recombine them with the original fleet to increase the number of commanders. Kudos for adding the diplomatic modifier for long and happy friendship. Cultivating relationships with AI Civs has the possibility to immensely add to immersion. Oh man, I AM a new player and everything you just wrote there, is SUPER accurate to my experience. I just started playing GalCiv3 like, three weeks ago? Dipped my toe in on New Year's Eve and a little bit the next day. I'm on my 2nd campaign now after a very easy diplo win with the Terrans. I'm enjoying the game, make no mistake. It's why I decided to check out the official forums. But I've been figuring stuff out entirely by trial and error. There is basically no documentation anywhere in the game, and none of the wikis are helpful. All of the ones I found were just lore on the universe. Which is nice. But it doesn't help me understand the systems the game has. Coming from just, regular non-Galactic Civilization as my main 4X and the old Birth of the Federation as my first space 4X (from ages and ages ago) I've been able to figure out how to play pretty well. But the fact that there's no reference list anywhere for finding out what is *supposed* to happen on any given question I have how a thing works is a bit frustrating. And the "tutorial" isn't much of one. It's a sandbox really. Which, I mean, I guess that's nice. I actually appreciate not having my hand held and letting me figure out systems and mechanics in a game. But when I just have a basic question about what X does (does it do Y? or does it do Z?) I'm still left hanging about it since there's no rules list in the game anywhere. A Civilopedia is a feature that would help new players a LOT I'd suspect. Especially the ones less experienced with the genre. Just somewhere I can click on the main menu that lists what building upgrades exist. What they do. How diplomacy is supposed to function. How tourism works. How trade routes work (there's a lot more to them if you want to optimize them). All that stuff. Oh, and to the OP/Dev - you're completely correct about the "DESIGN" button, in my experience. I clicked on that and was just completely confused as to what the heck I was supposed to do with it in my first game. It's a pretty robust tool now that I'm screwing around with it a bit in my second game as Iridium, but it was just a bit too much to be on the main screen when I was just starting out. Because that's exactly what I do: click on everything when I first start a game and try to figure out what everything does. And when it's a huge creation engine sitting in front of me before I know what any of the variables even mean, you just end up wanting to discard it. Either entirely, or at least for a while. BTW this leads to a confusing bit as a new player: installing precursor items you find in events. Right now I've gotten some events in a survey mission that just add a laser or something to a ship automatically. I've also had ideology choices that give me such and such precursor weapon. However, I have zero way of adding these precursor weapons to any of my ships without entering into the designer. And even then, I'd be designing a whole ship type to slot my single use precursor weapon. That's way too much effort to just try an add an extra bonus of an extra laser or missile or shield module or something. Especially when you're new and you don't want to mess around with the designer just yet. As a result, in that first run as a total newb, getting a precursor weapon as a "reward" meant absolutely bupkiss because I didn't want to go through effort of spending a few hours figuring out the system of desiging ships for a +1 laser to a ship. And, now that I AM messing with the designer, these things are REALLY underpowered. Mostly due to mass. They take up as much mass as their weapon type on average, but don't produce a noticably larger effect. At least according to the stats in the designer. A midpoint option needs to be in here somewhere. Like, instead of a full on "upgrade" option, I should be able to hit "retrofit" and just add a single cannon or something to a simpler designer window on a current ship that doesn't allow any alterations to the ship parts, but just installs weapons or modules. Either because I get a mass reduction specialization tech upgrade and can fit more stuff on an extant ship, or I get a precursor weapon and want to toss it on to one right away. Either replacing a current gun/module of equal mass, or using up any extra mass alotment so it fits. Right now, it's better for a new player hesitant to get into the ship designer (which I was also hesitant to get into because there's no tutorial on it and there are a LOT of buttons) to get that survey event which just adds guns to a survey ship for free than it is to get what seems like it's meant to be a stronger reward from an ideology point choice. It is not that complicated. You do not need to design a whole ship type, there are ready made templates that all you need to do is add the weapon to. Best thing they could do for the designer is remove the requirement to physically place ship components... they should be "invisible" items on a ship that you just add to a list. This would make it much faster to design a ship since it would not require selecting a hardpoint, sizing, etc. You can double click on a component and it auto places it. Sorry, let me be more clear... I'm saying it should be completely abstracted from position/placement... this would open up the opportunity to separate "ship design" in terms of ship components... from "model design" (aesthetics/physical pieces). A "basic" designer could then exist which doesn't allow "modelling" but would be far more simplistic for a new player. To me... its wholly unnecessary, but I was thinking of how to address other's comments above. Everyone's tastes are different that is why I wasn't comparing the game-play or mechanics, merely the user experience. Thanks for all of your hard work and true care for the game and those that are part of this fine family. This is by far the best game ever; not for pure profit like the overwhelming majority of other companies, but for passion (something that unfortunately is rarely seen anymore). One thing that I find particularly impressive is the fact that you are finally standing up to the egotism of the players. You have heard "me so horny" many times, yet you and the fine members of Stardock are keeping the 'zipper up' so to speak. I agree on that point for sure. You can see how the Star Control designer has learned from that. First, you have many from the older playerbase (i.e., galciv2 days) who are disappointed with the seemingly rushed state of the game on launch, and the fact that DLC's are essentially copy-pasting concepts from galciv2 directly into galciv3. Second, and most important, is the fact that the lines of communication between the dev team and the playerbase is rather poor. For example, it would be really helpful if the dev diaries posted here also made their way onto Steam. Additionally, the game feels like it's been back-burnered (partially due to the strained lines of communication and partially due to the lackluster DLC's). Furthermore, developer intentions have been unclear. Frankly, I cannot hide my incredulity in regards to the intended movement speed of ships mentioned above; given that you've been working on the galciv franchise for 20-30 years now, I had assumed that the concept of min-maxing should be rather familiar to you. Forgive me, but it sounds like you are back-pedaling desperately and borderline lying through your teeth. As an Elite Founder, most of these problems don't affect me. That said, I feel as though anyone who did not pre-order the game is getting screwed rather hard. Two friends of mine, who were ardent fans of the second game, purchased this one in the expectation that the game would function correctly upon release. Instead, they feel slighted because they instead received something that amounts to a three-year-long test bed for a new game engine. TL;DR Lackluster DLC rehashes of old game mechanics and poor lines of communication between devs and audience are working in tandem to kill your game. (Also, really bad quality of life hiccups such as GLARING typos in tooltips, descriptions, etc. 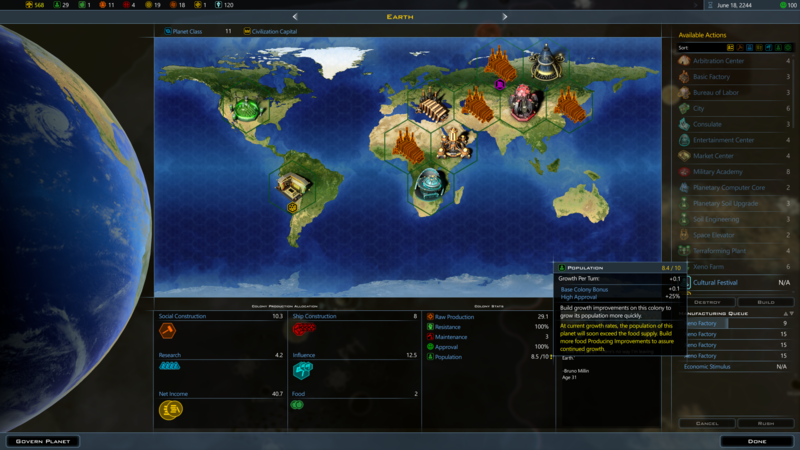 While I'm at it, none of the base factions feel special; you can remake them yourself via the civ designer. They felt special before because they had asymmetrical starting conditions, thus resulting in the illusion of the AI's having a personality; throw in an AI personality randomizer and you've got yourself a compelling and engaging gameplay experience [protip, don't release this as DLC]). Forgive the rant, but I feel as though the devteam working on this game isn't actually trying (either that or the game engine is so byzantine that it actively hamstrings production; though you're not at the mercy of third-party developers in this regard I suppose). On a positive note, every time I try to play this game following a new update or DLC, it works better than it did the time before; the part that kills it for me is the fact that the game doesn't feel worthwhile to play because non-cheating AI is too dumb and cheating AI is a grind (as a result, I always keep putting it down having never finished the game I started). On a final note, the development of this game is going better than that of Star Citizen; so there's that I suppose. That's pretty disappointing to hear. It seems like in 2017 we made a lot of progress on the game. Starting with Crusade and several major free updates to the game. Have you tried the v2.8 opt-in? Don't get discouraged, the progress isn't going unnoticed. It's kinda weird that the old game mechanics weren't there to begin with, but I can tell they are less "copy paste" and more "bring it back x100". My main concern is the AI being behind GC2, but Wardell's recent posts about it have me feeling pretty good about it not staying that way in the future. To be sure, I don't think SD should get discouraged... okay... let me rephrase... I hope they find the will to remain true to their good work. Its been a bumpy ride, but there is definitely a lot of hyperbole coming from fans as well. Crusade is definitely a massive improvement. I think the new player piece, is both UI, but also just certain features that are either semi-working or counter intuitive. I'd like to note that I am not a founder, own all but the mech-parts DLC and found many of the DLC very worthwhile. I don't value campaigns, so that did limit the value of some for me, but that is personal taste (and I got ship parts out of the deal). Mercenaries, Snathi, and Crusade are Must-Haves. I have been with this game since 2016, never played GalCiv2 much and only since GalCiv3 was released and I have found the progress this game is making quite obvious. Just the 2.8 opt in has made playing noticeably harder on Gifted that I have lost the last three games I started because I keep losing planets and war is no longer a walkover, far from it that I feel I am always trying to catchup and enemy ai now makes fleets which you can't just overpower like before when every game was making a strong navy and rolling over everyone as they didn't build anything like what a human player could have. They are attacking with good fleets and transports and will seek out your easiest planets to take. Yes, there were a lot of improvements in 2017, no doubt about it. As I said in my personal review the road here was somewhat bumpy and frustrating at times (for this fan anyway) but GalCiv 3 is definitely heading in the right direction. The improvements in AI and performance, ongoing tweaks and adjustments are recognized and much appreciated. I would encourage you and the developers to not be discouraged. I know the Steam scores are a source of concern but most of us who have stuck through this development from the beginning have seen the improvements and do appreciate the continuous support. Despite what many critics may say, there is a lot to love in this game. Coming from someone who stepped away from it for a while until the Crusade expansion came out, trust me...there's a lot to love about GalCiv 3 now. To be honest, today's gamers as a whole make me sad. The entitlement mentality, the "us versus them" attitude, makes me glad I was never smart enough to get into game developing especially in this day and age. To some, everybody's just as bad as Electronic Arts. I've worked in retail management for years now and I thought I'd dealt with some holier-than-thou people. Whew! It doesn't hold a candle to what you guys put up with. Well, that went off the rails. My apologies. But to Brad and Co. I say kudos on making right what, at first, looked kind of "meh". Galactic Civilizations 3 has a lot to be proud of and so does your development team. I strongly encourage you to keep it up. Trust me, it's getting better. I consider my initial buy-in to be finally paying off. I have enjoyed the game since Beta, but have been waiting for Brad to get hands on with the AI. It bothers me that so much in the mechanics has gotten nerfed in the name of progress, but it has been progress. All I can say is please Brad don't stop now. Thanks!